Seattle University (SU) is a peaceful bubble of a college campus with lush flora galore, giving off the impression of an institution which values environmental stewardship. However a small group of passionate SU students, known as Sustainable Student Action (SSA), have been making some noise about their administration’s behind-the-scenes actions by calling on them to stop investing in oil company stock and to further disassociate with environmentally and socially unsustainable and destructive fossil fuels. 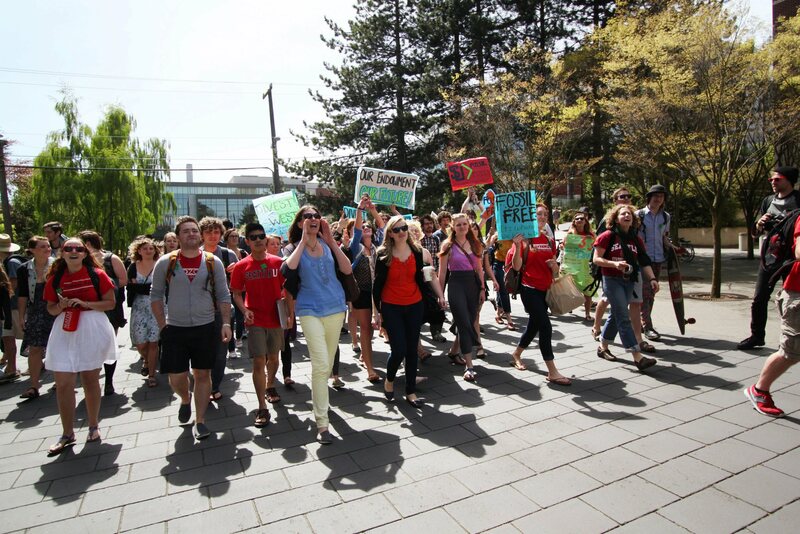 SSA organized divestment rally earlier this spring. Photo courtesy of SSA. “As an environmental group we are asking our school to put their money where their mouth is,” said Hannah Nia, a key organizer within SSA. Like most colleges, the SU administration has access to and control over an endowment fund amassed from alumni contributions. The specific amount is unknown to the administration’s lack of financial transparency, though SSA estimates it numbers around $160-180 million. Some of these funds are then in turn put into the stock market for the sake of the university’s eventual financial profit from flipping those shares. However, a portion of that money gets invested into fossil fuel company stock. SSA believes these oil money shares to be around 4% of the total endowment. This is money invested in companies such as Exxon Mobil, Chevron, and the infamous BP corporation, the perpetrator of the devastating Deep Water Horizon oil spill in the Gulf of Mexico. SU students and SSA have found this action to be very contradicting to the college’s claimed sustainable values. The official SU website touts a number of sustainable attributes such as LEED certified buildings and community gardens. SSA members Iree Wheeler & Hannah Nia. Photo by Josh Kelety. “They [the administration] aren’t living up to their values if they are invested in these corporations,” Nia added. In response to the SU’s rubbing shoulders with oil companies, SSA has made a formal request of the administration to put a freeze on new fossil-fuel investments and a gradual decrease in current stock, bonds, or other investment funds. In addition, SSA has circulated a petition in support of divestment, which a total of 650 out of 4,589 SU students have signed. In previous years SSA had promoted the Ban-the-Bottle campaign, and consequently, got the administration to disallow the distribution of plastic bottled water on campus. 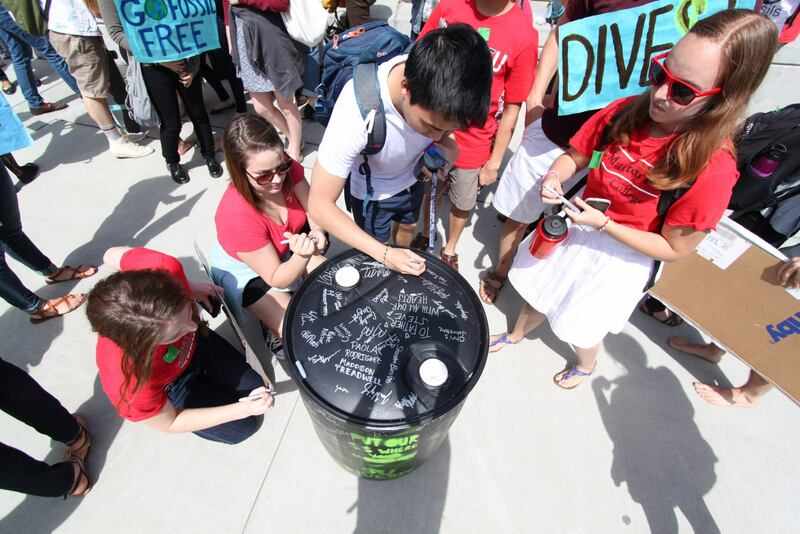 In addition, SSA organized a divestment demonstration on the SU campus last spring, going as far as to having students sign a massive black water barrel – symbolizing a barrel of crude oil – and placing it in the college president’s office, sending a message of disapproval of the admins’ financial choices. SU students sign ‘crude oil barrel’ at Spring 2013 rally. Photo courtesy of SSA. SSA has around 15 regular committed members but has wide-spread support throughout the SU student population, the SU student government, and select faculty members. In addition, SSA is part of a broader coalition of divestment campaigns on college campuses and in city governments. The Guardian reported that Unity, Hampshire, Sterling, and College of the Atlantic are universities that have achieved full divestment from fossil fuels, and more than 300 other college campus have similar efforts underway. 10 U.S. city governments, including Seattle’s – spear-headed by ex-mayor Mike McGinn – have called for public employees to divest. The notion of divestment being one approach to de-valuing fossil fuel companies first surfaced with the creation of the 350.org campaign. Bill McKibben, an author and environmental activist founded the organization back in 2007. “It’s a movement that’s pretty specific to colleges and universities. But at the same time cities can do it [divest], businesses can do it, people can do it,” said Katherine Dietzman, another SSA member. The SU administration has yet to remove any money currently invested in fossil fuel companies according to Nia, but SSA is hopeful that with enough pressure and support a change of heart will be possible. 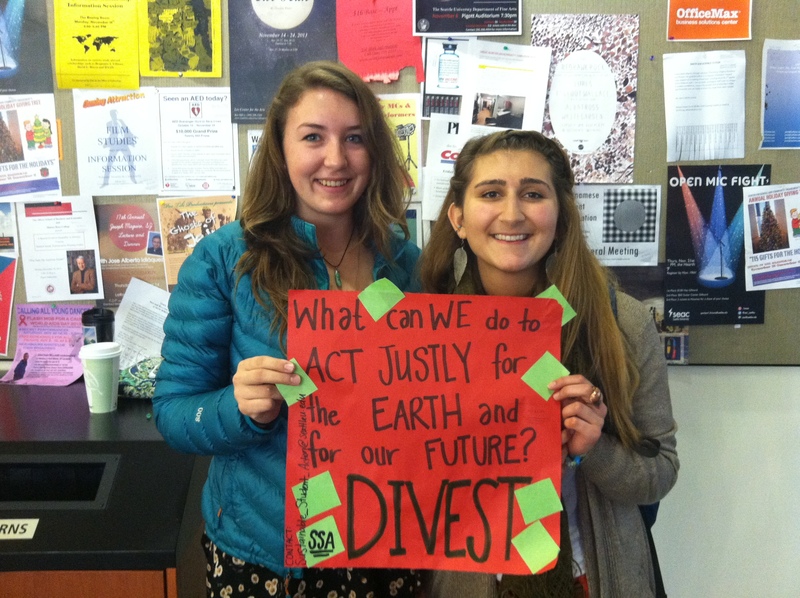 More information on the case for divestment and how go about it can be found here.